Katie is a sweet and sensitive collie seeking an owner with a calm and quiet lifestyle. The nine-month-old’s confidence is growing day-by-day, thanks to the Dogs Trust Shoreham rehoming centre. Manager Tracey Rae said: “Katie can be fairly shy, however her friendly character doesn’t go unnoticed. “Although Katie is gaining confidence, her delicate nature means she would best be suited to a peaceful home where she can settle in at her own pace. “A sensitive soul, Katie prefers to be walked in rural areas, away from traffic. 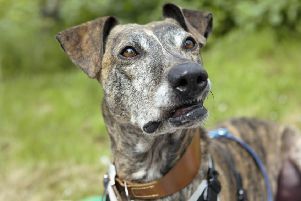 Katie would love a garden and will need a home were residents and visitors are aged over 16.